Whether you need more room for sports equipment, work tools, or your passengers, the All-New 2019 RAM 1500 features the most spacious interior yet. With an overall increase of four inches in the crew cab length, you will receive the best-in-class rear legroom. Advanced aerodynamics, reinvented wheels, and a resculpted hood are only a few of the innovative additions to our latest pickup truck. You can also customize your own ride with 16 all-new wheel designs, featuring available 22-inch aluminum wheels that are offered in the All-New RAM 1500. The strongest, most capable RAM 1500 yet is finally here; re-engineered from the inside out. The All-New RAM 1500 delivers durability every time with the best-in-class V8 engine towing up to 12,750 pounds and 2,300 pounds of payload along with a high-strength steel frame that will enhance your performance. 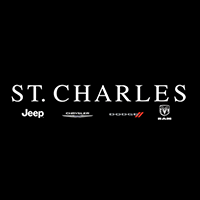 To simplify not only your work life, but your driving needs, St. Charles Chrysler Dodge Jeep Ram is only one visit away! Take a moment to visit our local and friendly dealership to get a chance to test drive the powerful All-New Ram 1500 today.